Returning from a round of golf Verner (Casey Biggs) finds his wife Anna Mary (Mia Dillon) entertaining Princess Caragnani (Maureen Anderman). Kevin Sprague photos for BTF. Verner enjoys a soulful laugh. Verner and Anna Mary argue after a disastrous evening. Maud and Verner find love and plan to run off together. The set for A Song at Twilight. 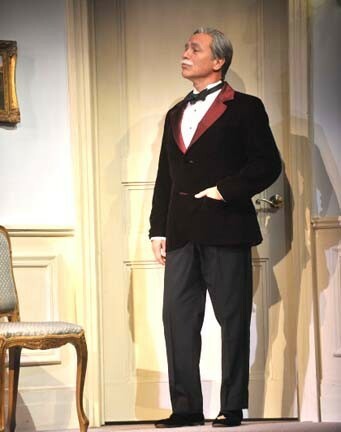 Biggs as the arrogant author Sir Hugo Latymer. Sir Hugo remarks that Hilde’s hat is outrageously masculine. 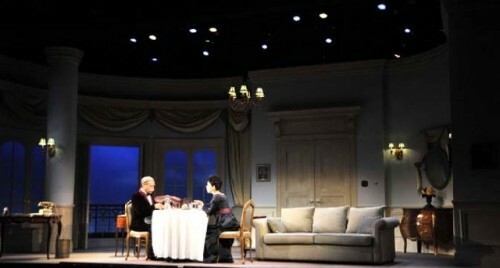 The dinner meeting between Sir Hugo and Carlotta was awkwardly staged. Arguing over his old love letters. The women in his life discuss Sir Hugo’s closeted sexuality. 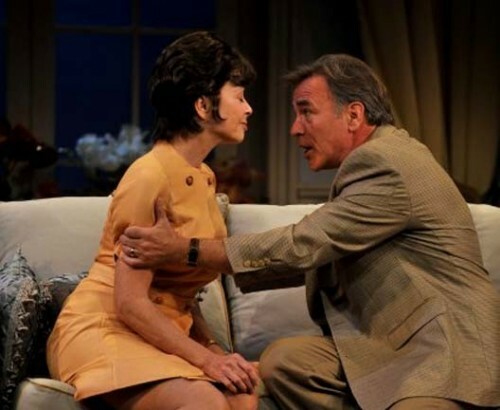 The director, Vivian Matalon, brings to this riveting and delightful production "Noel Coward in Two Keys" at the Berkshire Theatre Festival, through August 30, remarkable insight and history. 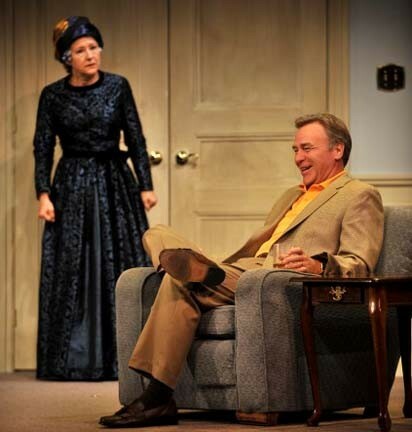 In 1966 he directed Noel Coward (1899-1973) on the London stage in the last of his some 50 plays. 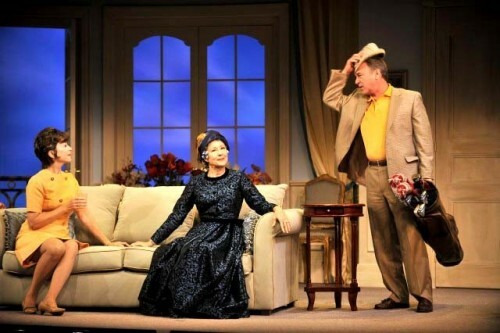 The London production was titled "Suite in Three Keys" and included three one act plays. When Matalon directed the plays on Broadway in 1974, starring Hume Cronyn, Coward was deceased. "Shadows of the Evening" was deleted as it was concluded to be unsuccessful. The BTF presents the other two plays "Come into the Garden, Maud" and "A Song of Twilight". 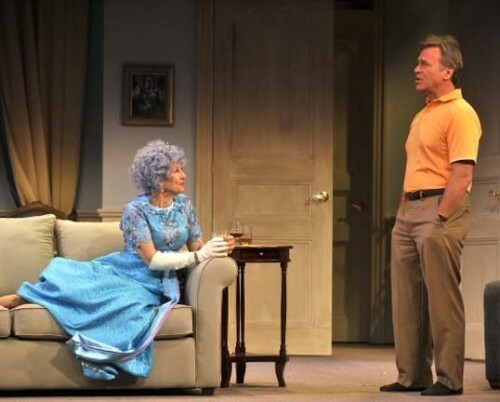 The plays share the same set, by R. Michael Miller, an upscale hotel room in Switzerland. They both entail a man in conflict with two women, a wife, and the other woman. Felix (Gian Murray Gianino), the handsome and suave servant, has the same role in both dramas. The actors are so skilled at creating different characters that one had to look carefully to realize that they were one and the same in both plays. Part of this was the clever use of wigs (created by David Lawrence), and the costumes of David Murin, that provided such a different look and feeling. This was particularly evident in the very different, day and night, roles by the leading man, Casey Biggs. In the first play he portrays a loud, rich, and crass American, Verner Conklin, who indulges his strident, social climbing wife, Anna Mary (Mia Dillon), in a five month tour of mingling with minor European royalty and celebrities. By the second play he is so restrained and subdued as the autocratic, closeted author/ celebrity, Sir Hugo Latymer, that we have to strain to identify Biggs under that wig and moustache. 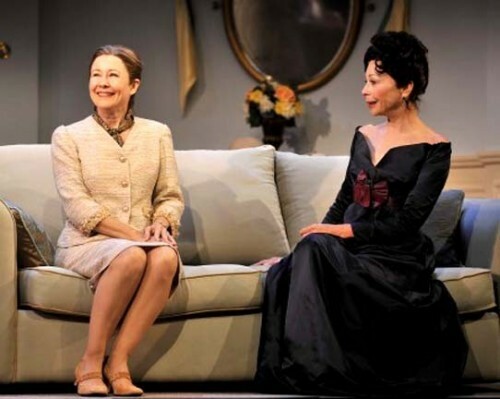 Similarly, Dillon does an about face from the abusive, demanding wife in the first play to an abused and manipulated spouse (Hilde Latymer) in the second one. She also switches off from a nouveau riche American to a low born German wife and former secretary to a renowned author. While enduing his taunts about her German heritage Hilde lost the only man she ever loved in a concentration camp. They have, at best, a marriage of convenience. 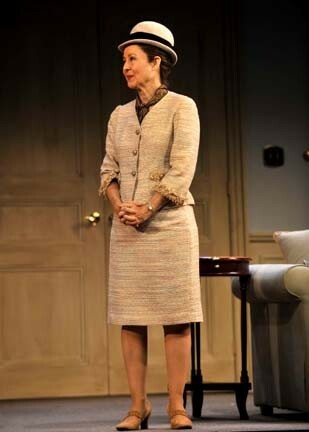 The wild card in this mix of witty, wordy, class conscious comedies is the remarkable Maureen Anderson. In the first play she is a titled, but impoverished, gold digging, Sicilian Princess, Maud Caragnani. 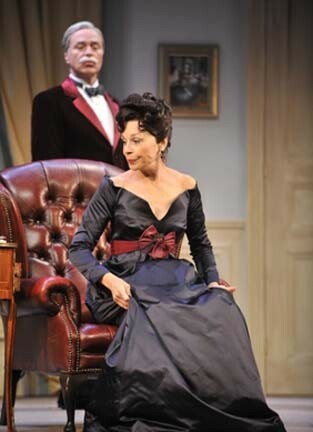 In the second play, Carlotta Gray is the former lover of the self absorbed, nasty, vindictive author. Of the two plays, the first "Come into the Garden, Maud" is shorter, over the top, and generally more hilariously entertaining. Coward offers a richly amusing send up of what were known, back in the day of the almighty dollar, as "Ugly Americans." Here Coward reveals their crass manners in direct proportion to wealth. It is familiar territory mined, arguably, with more depth and nuance by the Americans, Edith Wharton, and Mark Twain. The social commentary of self deprecating Americans is sharper and more resonant than the pot shots of Coward, a Brit, who was, himself, a commoner. With pluck and luck he rose to the Knighthood and the company of Royalty. The social ambitions of rich Americans are a bit too easy as a target for humor. One rather doubts, today, that even the mega wealthy Verner would be tipping the servant $50 for just wheeling in dinner. Adjusted for inflation that was more like $500. While Coward has his fun skewering wealthy Americans with regal ambitions the second play cuts closer to the bone. The role of Sir Hugo Latymer was inspired by the closeted W. Somerset Maugham who apparently suffered for not admitting to his sexual orientation. Like Maugham, or Cole Porter for that matter, Latymer married to divert gossip. Coward, who was homosexual, never flaunted nor admitted to his sexual preferences. 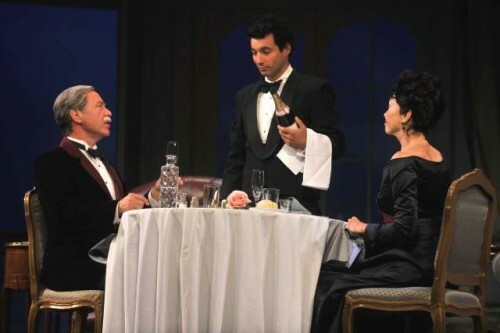 Because so much has changed "A Song at Twilight" might be viewed as a period piece but Matalon and the superb cast has dug much deeper into the characters, their conflicts, and universal issues of fame and mortality. What connects the seemingly different plays, sharing those upscale suites in Switzerland, are the themes of lies and deceptions. With the exception of Felix, who works for tips and is willing to take the attendant abuse, the characters are driven by greed, ambition, and a striving for social status. In his memoirs Sir Hugo has taken no prisoners. He revealed his public persona as a creator but held back on the dark secrets of his personal life. While celebrated he is nasty and bitter even to his sham wife who serves and dotes on him. Now a woman from the past arrives for a bit of payback. While Hilde leaves them alone, to join a German woman friend "lesbian" for dinner and a movie, Sir Hugo meets, after a lapse of many years, with a former lover, the now retired actress Carlotta Gray. He trashed her in his memoir as a mediocre actress. It seems that she too is about to publish a memoir. Carlotta would like to obtain permission to include his youthful love letters to her. He dismisses this out of hand. Until she plays a trump card by revealing that, on his death bed, she has obtained another set of love letters. There is neat reversal as his pompous persona faces a melt down at the prospect of being publicly outed. It was a stunning evening with good fun and many a hearty laugh evoked by the wit of Coward's writing. But also sadly poignant and insightful as we look behind the curtain at sexual preference, fame, wealth, titles, and privilege. There are some quibbles. Biggs had too much volume as the loud mouthed American. Particularly when contrasted with his reserved, sotto voce role as Sir Hugo. In the second play he brilliantly milked the skill of pregnant pauses. The costume and makeup of Anderman as Carlotta Gray did her no good. She struggled moving about in an excessively shapeless, silk evening gown. Her ghastly makeup, perhaps intentionally, revealed one nip and tuck too many. The script informs us that she is in Switzerland to visit the clinic of a plastic surgeon. The staging was awkward when Sir Hugo and Carlotta are seated front stage stabbing at food, and each other, at a table wheeled in by Felix. They were far too static for such a cathartic exchange. Coward has fun with Americans struggling with European languages. Dillon handles this brilliantly as Anna Mary speaking terrible French on the phone. Anderson, portraying a native European, was quite adept in French and Italian. But Gianino struggled with the nuances of dialect. Coward hasn't given Felix much to work with but Gianino failed to make the most of it. A final thought. Can you ever get enough of Noel Coward? Particularly, when it is done so superbly! Bravo, and thanks to the Berkshire Theatre Festival for bringing us this lesser known last work.